can anyone give me the name of the actual cab, ive been searching the internet with some results pdf's ect..
but im getting confused am i right is it a sentry IV , senrty IVb, ect ect when it has the original mid/high horn tweets ect. also got numbers tl4025.....tl4050 ect..
also can anyone recomend drivers closest to the Originals.. Here is a link to the EV discontinued speaker system page. I think the cab is a Sentry IV but can't see it listed there. Im guessing original drivers would have been probually DL12x ,(but the OEM version without the finned magnet cover)? That was their mainstay 12" from around this period. 12inch paper cone and 2.5inch voice coil.....anyone suggest a modern replacement? Thanks for your repley still. is the ev DL12x still in production? or is that a stupid question. but ive seen Electro Voice EV DL12X Recone Kits on the net. been digging though my pc and found someone has mentioned these before but cant find it now sadly. i bet too these drivers would cost a small fortune yes/no? Quoted by someone T/s Parameters. so its not that drastically different. any thoughts/opinions.would these work ok in sed cab? THey was going the same time as the eliminator1A. Its notb a 4025 or 4050 which is 1x15" & 2x15" and a very large cab But they do work they had DL15 in them. We only used 1 for sub in the install aprox 300-400 people. It closed in 2 years and moved the cab in to main venue 2000-2500 people. I am suprised there is not more people used them! It walks all over a MT4. its just the size. 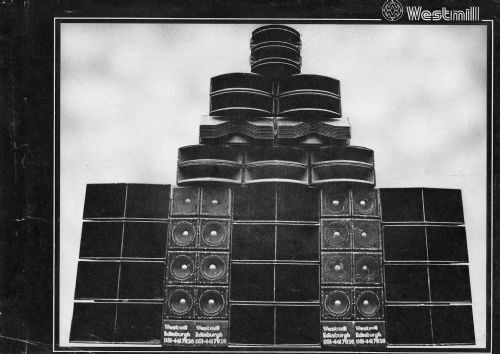 Any way back to the W bin I think it was loaded with 2x EVM12L which is not a bass speaker. I have plans some where in my files. Used by EV for jazz festivals in the 70's and early 80's. Give me some time and i will see what i can find in my files. Right the cab is a TL5050 When with horns it become's a Sentry 1V BR drivers are EVM 12L like i said though the response is only down to 50HZ 121DB at 10ft at full power 100-800HZ mid power. I hope this is of help for you. Thanks for the Info much appreciated .,still might try the EV-DL12X Driver in them one day.. Try a couple of ATC 12" BLCR's in them, they certainly worked very well many years ago and were a marked improvement over the EVM's..... used the first version of these cabs. Also had a pair of the separate Sentry 4 horn mid/top boxes, Hf drivers were mounted in the centre of the Mid Horn. Think that the Mid Compression driver was the 1823(?) - screw fit. The UK EV distributor in Brighton did a moulding of the Mid Horn as well which I had 2 of, although these didn't have the mounting points for the HF Driver/Horn, and managed to get some free time in the Bath Uni Architectural Department Anechoic Chamber to test them properly back then. Anyway, was playing with designs for analog active Xovers with BBD delays back then so achieved more control compared with the passives. Long gone now, but very good at the time with lots of learning gained about active systems back in the 1970's which still apply today! plus springs, washers, screws, etc, etc. I found this in my files. I hope it helps you. Those old EV cabs were very pretty. The Eliminator 1A always looked really professional (didn't really sound it, though) and the Jumbo Hi cab looks impressive. 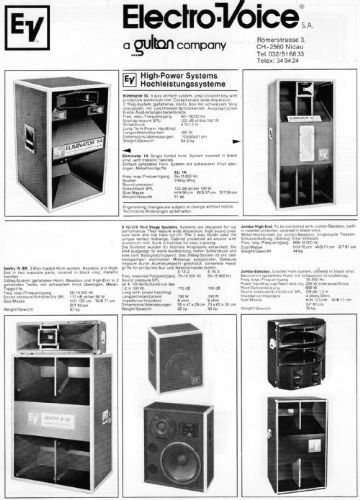 I remember having the whole of this catalogue way back when - along with a classy Altec catalogue from around the same era.